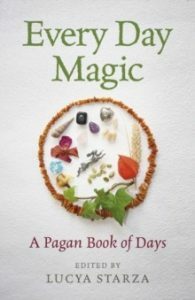 Every Day Magic – A Pagan Book of Days contains 366 spells, rituals, meditations, Pagan prayers, divinatory techniques, poems to read and recipes and craft projects to try out, along with the details of festivals that take place throughout the year. All the activities are intended to be easy to follow so you can pick up the book, open it to a day and find something you can do. There are festivals from the ancient world and modern Pagan celebrations as well. We are excited to be launching this terrific book for a couple of reasons. First, Geraldine has contributed to it. And second, we have hosted Lucya several times here at the Shop for her Candle Magic workshops and love what she does. So please do come along to help us celebrate the launch of this work – there will be an afternoon tea, and it is hoped that several of the contributors will also be present. If you wish to attend this launch, please RSVP to the Shop either by emailing or by calling us on 02074052120. We look forward to welcoming many of you on the day. If you are unable to attend but would like a copy of the book reserved and inscribed for you, please contact us and we can organise that for you.